MSRT Installation Tool is used to install R2, R5, R5 1/2 and R6 fasteners. For belt widths 30" to 84". Easy-to-use, portable tool that makes multiple rivet driving simple and fast. The MSRT tool holds the belt, fastener strip, and the SR700 guide block (included) securely in place. 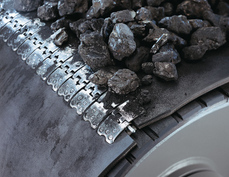 Using the SR759 drive rod, five rivets can be driven simultaneously. 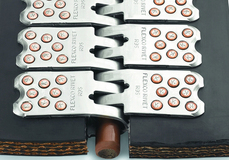 Plus, each guide block holds enough rivets to install four fastener plates before reloading. MSRT tools require little maintenance. The MSRT includes application tool, two SR700 guide blocks, two SR759 drive rods, canvas bag, silicone spray and two 4 lb. (1.8kg) hammers. Lightweight and portable application tool. The new scalloped design of the riser plate allows for fast, accurate alignment of fastener strips on the anvil plate. 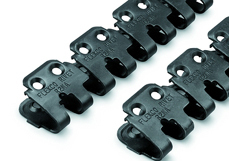 The riser plate positions the belt for easier feed into the fastener strips. Robust design of clamp bar with Acme threading provides maximum holding capabilities, especially on thick, high tension belts where a safe, strong hold is required. Clamp bar and riser plate have been designed with serrated grips for more secure clamping and operator efficiency. Use Rapid Loader™ Collated Rivet Strips to load 20 rivets at one time for reduced installation time and increased operator efficiency. The economical priced R2 Fastener application tool is light-weight and portable, so it is ideal for quick repairs. The six-pound (2.7kg) R2T tool installs up to 12" (300mm) of R2 fasteners in one pass. For wider belts, simply move the tool over. For use with standard SR™ self-setting rivets and a two-pound (0.9kg) hammer.